Like New Orleans, Baton Rouge was crafted by Cajun, Creole, Spanish and French forces into a spicy cultural stew of a city. The chefs added a little something extra into the roux when they made Baton Rouge though, as a massive student population and lively legislator class put Baton Rouge in a category all of its own. Baton Rouge is stacked with so many significant historical, contemporary, and cultural sites, that like the politicians that populate the city, you'll be faced with some hard decisions: namely, where do you start? Since nothing has affected the fortune of Baton Rouge more than the decision in the 1840's to make it Louisiana's state capitol, seeing the state capitol buildings is a great way to get your bearings and peer a bit into Baton Rouge's history books. 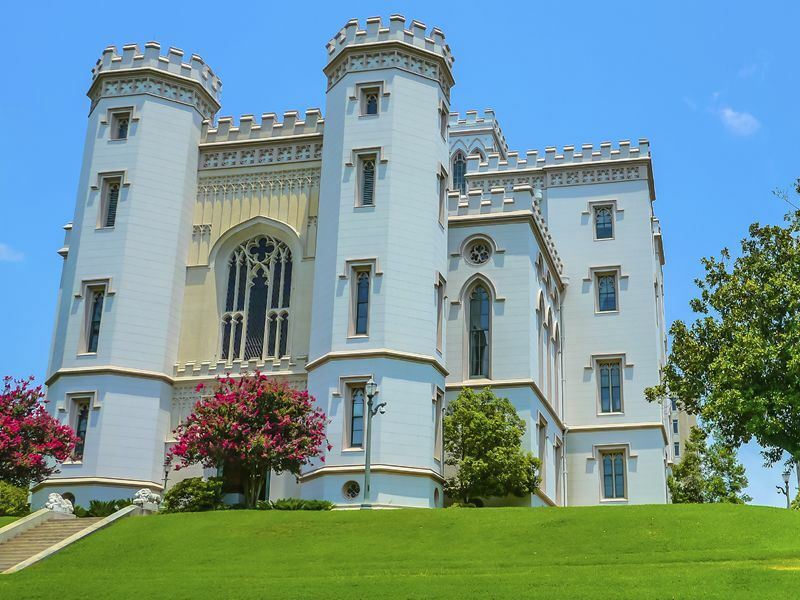 Perched upon on a Mississippi River bluff, the original state capitol was deigned in a Gothic Revival style, resembling a cartoon-ish white castle . Almost immediately from its construction, the capital was on the receiving end of scorn from residents and passing riverboat passengers, the most famous of the latter being Mark Twain, who called it a "little sham castle". The current state capitol is an Art Deco wonder of a tower that soars 450 feet to the sky and the view from one of its top floors is a fantastic way to see the city. For a bit of rural Louisiana right smack in the middle of the city, Blue Bonnet Swamp Nature Centre is a refreshing stop that features a wooden boardwalk constructed over a swamp. A stroll on the walkway allows you to admire the beauty and wildlife of the swamp from a safe distance. Home to over 30,000 students, Louisiana State University is a major American university and influences almost all aspects of Baton Rouge. When school is in, the town buzzes with life, and for a visitor, the university contributes several things to a Baton Rouge bucket list. The LSU Rural Life Museum gives visitors a snapshot of what life was like in rural Louisiana in the 19th Century. You'll feel like you have stepped back in time when viewing the plantation quarters, Louisiana folk architecture, and antique cotton processing equipment on display. For a breath of fresh country air in between sights, head to LSU Lakes, a series of lakes located right by the LSU campus where locals and students alike jog, relax, and take in the scenery. No discussion of LSU would be complete without a mention of their famous American football team. The LSU Tigers compete in the most elite league of college football, the Southeastern Conference, and have won several national championships. If you are here in the autumn, you will see how the town lives and dies by every Tiger play, and roars with a raucous atmosphere during Saturday afternoon home games. To fully appreciate Baton Rouge and LSU's connection, attending a home game after a full morning of pregame celebrating called "tailgating" is a must. Starting your day out with some coffee and beignets is a Louisiana tradition, and Coffee Call is there to answer the bell for you. For a little over two dollars, you will be served three pillowy and sugary beignets and although you may end up covered in powdered sugar, they should hopefully keep you full until dinner time. For a great example of a modern American bar and grill with a Louisiana twist, head to Mason's Grill. World famous for their Cajun shrimp burger (a beef burger topped with succulent shrimp and melted cheese) Mason's has a menu full of classics and recently won the award for the best Bloody Mary in the United Sates, a drink that Louisianan's take seriously. While in Louisiana, you have to try some seafood, right? Well, Parrain's is a great place to get your fix fried up fresh. Well-known for fried seafood specialties such as catfish, oysters and shrimp, this restaurant is located in a casual setting that is reminiscent of traditional southern seafood shacks. Like the food, Baton Rouge has all flavours of accommodation. For a spot right on the mighty Mississippi River, the Hilton Baton Rouge Capitol center impresses. Their stately rooms and pool overlook the river, within walking distance of riverboat casinos, where you can take a chance at meeting Lady Luck. For those wanting something with a bit more of an intimate atmosphere, there are several bed and breakfasts in Baton Rouge, all wrought with Southern Charm. Article written by Julia Evans.